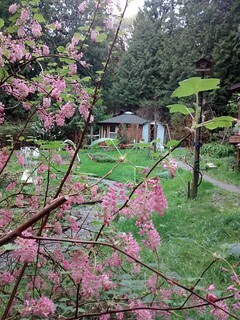 Our ten acre forest sanctuary on Bainbridge Island, a half-hour ferry ride from downtown Seattle. Come enjoy the magic of Sacred Groves! The Sacred Groves Bed and Breakfast received its business license in 2009. We are a little “Eco-retreat” inspired by our values of voluntary simplicity, sharing resources, and minimizing our impact. We welcome guests year-round. Our Guest Yurts are sweet, round free-standing yurt-cabins near the Round House that can sleep 2-4 (Cedar Yurt has queen bed and couch that works well for one; Sun Yurt has a queen bed and a fold-down foam-on-floor couch that is double size). They are spacious, warm, light, internet access via wifi, have electric heat and outlets. The bathroom is a few steps away in the Round House–Cedar Yurt is closer to the house than Sun Yurt. There are a few small kitchen appliances: coffee and/or tea maker, micro-wave, toaster oven, small refrigerator. When staying at Sacred Groves you will have access to wifi, forest trails, labyrinth in the woods, meadows, beautiful gardens, sunny deck space, trampoline and parking. “Forest Bathing” is encouraged! If you want to use the kitchen in the main house to prepare a meal, please arrange this with us so the kitchen will be clean and ready for you. Sometimes this may not be an option because of other activities in the main house. Children are welcome, and if you would like to bring your animal friend with you, please let us know. We have a cat and chickens. Note: several photos of the inside of our guest yurts are below, at the bottom of this page. 1-6 nights: $75/night for 1 person (add $5/person for additional people). 7 nights or more: $55/night (add $5/person for additional people). We request a $10 cleaning fee if you bring a dog. Rates include coffee/tea available in your yurt. Check-in Time is 3pm. If you want to arrive earlier than that…..let us know and we’ll see if we can accommodate you. Check out time is 11am. Meals: We don’t generally provide meals for our guests. We are only a 10 minute drive from grocery stores, deli, and restaurants in the downtown area of Bainbridge Island and a 10 minute walk from a Thai restaurant and jiffy-mart type store. What to do on Bainbridge Island: See www.bainbridgeisland.com for a list of all the wonderful things to do in this beautiful green island in Puget Sound. “I’ve always been a sociable friendly, extroverted individual, so when I started getting repeated promptings to pursue a “walk within” (or solo retreat), I wasn’t sure about just how to find the right spot in which to sequester myself. Armed with the internet, a short list of requirements, and faith that I would find that which I sought, it wasn’t long before Sacred Groves became the obvious answer. They had an ideal-looking yurt available on the dates I was interested in. The costs were reasonable, the site was beautiful and acessible…while still seeming remote. Everything got organized and arranged so effortlessly, and I got a further “good feeling” from my communications with Tere and Therese.